April 8, 2009 - With a new plan to deal with the financial crisis and an aura of goodwill surrounding the first days of Barack Obama’s presidency, trust in the stock market made slight gains in the first quarter of 2009, according to the most recent findings in the Chicago Booth/Kellogg School Financial Trust Index. In contrast, trust toward banks and large corporations has continued to decline in the last three months, following recent headlines of corporate layoffs, executive bonuses, and banking disasters. The researchers found that from Dec. 2008 to March 2009, the Financial Trust Index has dropped slightly from 20 percent to 19 percent, with its subcomponents showing distinct shifts in trust in both directions. Seeking to formalize the relationship between trust and finance, Sapienza and Zingales analyzed data from more than 1,000 American households, randomly chosen and surveyed via phone during two weeks in late March 20092. 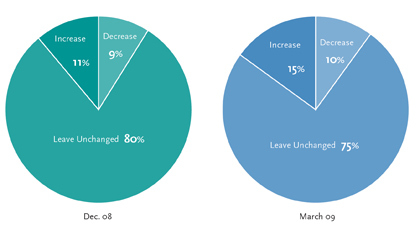 This wave is a follow-up to the inaugural Jan. 2009 findings. Notably, the researchers report a slight increase in trust toward the stock market, from 11 percent in Dec. 2008 to 13 percent in March 2009. Banks and Large Corporations At the same time, Sapienza and Zingales point out a substantial decrease in trust toward banks, from 34 percent in Dec. 2008 versus 29 percent in March 2009, and in large corporations, from 12 percent to 10 percent over the same time period. This issue of the Financial Trust Index also studied the impact on trust vis-à-vis the government’s intervention in the financial system. 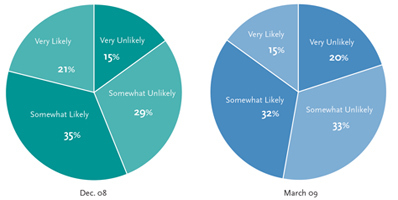 The March 2009 results demonstrate that government intervention still makes the majority of Americans less confident in investing in financial markets (67 percent). 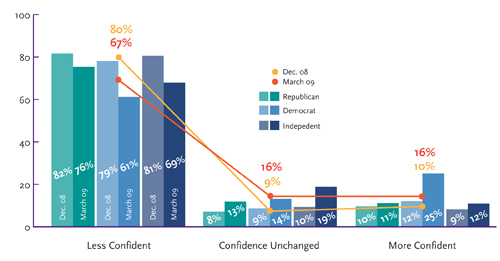 However, this is a considerable change from 80 percent who felt less confident in Dec. 2008. This improvement in trust is mostly concentrated among Democrats and Independents. In this wave, 25 percent of respondents who identified themselves as Democrats feel more confident in investing in the stock market after the government intervention, compared to only 12 percent in December. Twelve percent of independents feel the same way, as compared to nine percent three months ago. However, the fraction of Republicans who are less confident in investing in the stock market following the recent government interventions has dropped from 82 percent in Dec. to 76 percent in March. 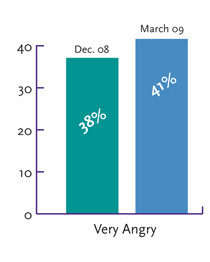 More respondents (41 percent) in March 2009 said they were very angry with the current economic situation compared to 38 percent in Dec. 2008.